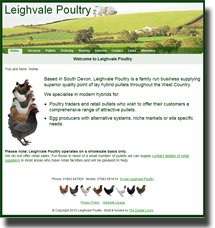 Leighvale Poultry are a local business that had an existing website. Their requirement was for a bespoke content management system (CMS) that would allow them to set-up user accounts for their regular customers in order to be able to publish information regarding forthcoming batches as well as lighting & vaccination programmes. The task then was to build a new site in the image of the old, making significant improvements along the way, but which included a new CMS. The website is “dynamic” and runs on the Microsoft ASP.NET MVC 2 Framework and uses Microsoft SQL Server 2008 for data storage. It was coded using C# and employs the MS Entity Framework for database communications. 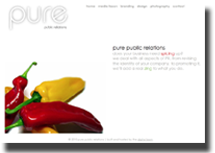 A simple site that provides a simple web presence for this small public relations outfit in Devon. Being a PR firm they knew precisely what look they were after and, being very clear with their instructions, the finished site looks exactly as requested. The website is “static” and runs on the Microsoft ASP.NET 3.5 Framework and is coded using C#. 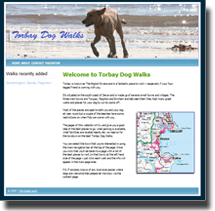 Torbay Dog Walks is a small site that provides information about the best places for dog walkers in Torbay. Its aim is to inform locals as well as holiday makers of the best places in Torbay to go for a good walk. The website is “static” runs on the Microsoft ASP.NET 2.0 Framework and is coded using VisualBasic.NET. Thanks for coming – please visit again soon! If you'd like more info on any of the above feel free to contact me by phone or email, or use the form on this site. Details can be found on the Contact page. I'll get back to you for an informal chat about your needs and how The Digital Loom can help.